Cut the manchego cheese into small rectangle pieces so they’ll fill the hole of the olive. Place one cheese plug into the center of each olive. Prepare the breading station with 3 separate shallow bowls. Use one for flour, one for eggs, last one for panko. 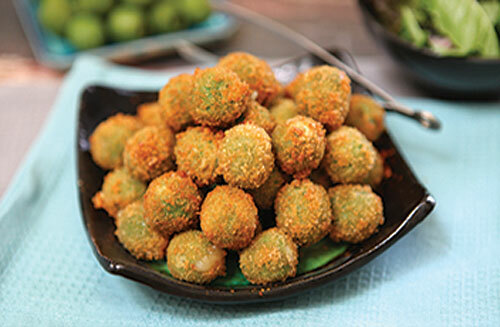 Drop the stuffed olives into the flour first, remove and gently shake off any excess, place into beaten eggs to coat, then drop into panko and roll around until fully covered with breadcrumbs. Heat a few inches of oil in a saucepan to 350º F. Fry olives in small batches until golden brown in color. Remove with a slotted spoon and place olives onto a plate with paper towels to absorb the excess oil. Let sit for 5-10 minutes and serve warm.